I attempted to follow directions but when I click on link, it just takes me to blogger edit page, not the part of the document that I desired. Thoughts? 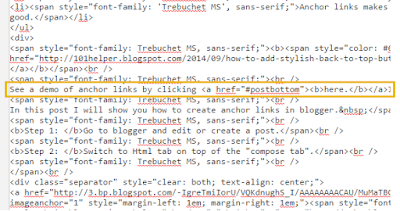 Now you have to remove this https://www.blogger.com/blogger.g?blogID=82938298392393382 and after removing it publish the post without switching to composer tab, it will work properly, remember to do this every time you edit a post having anchor links. If you still have any problem ask me. Thank you very much for this post and for sharing your knowledge. 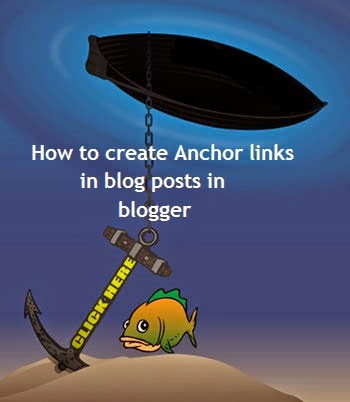 Your post about anchor links provided the clearest, simplest, and easiest to follow instructions. Thank you for the explanation and help. It is very much appreciated. Cheers! Thanks a lot I was very confuse and misunderstand what should I do but now it is clear. thanks again. i followed the instructions , but although the link is active , it does not do the jump. I, too, followed the instructions, and the links are still active, but when I click on them I'm directed to a page saying, "Sorry, the page you were looking for in this blog does not exist." I didn't switch to Compose. Any idea what happened? Thanks. Worked great! ...Except for the links to other pages' anchors. Is there a way to make those work as well? 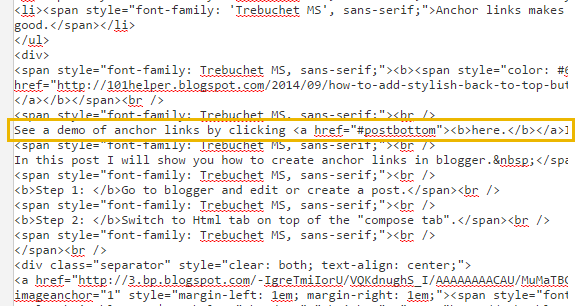 Links to other posts can also be anchored by adding #ID OF DIV at the end of your other posts links for example https://101helper.blogspot.com/p/download-template.html#bottom this link will take you to bottom of one of my page.